The TT RS has been punching above its weight class since it was introduced at the 2009 Geneva Auto Show. The current second-generation car, underpinned by Volkswagen’s MQB chassis, is a proper sports car that provides acceleration on par with many supercars. Thanks to Quattro all-wheel drive and a 400-horsepower turbocharged inline-five the TT RS sprints from 0-60 in a killer quick 3.6 seconds. 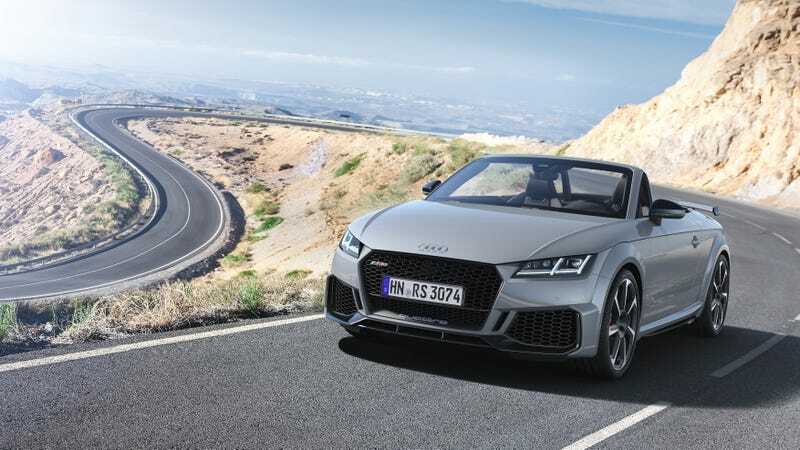 The 2019 model keeps all of what makes the TT RS awesome and adds a dash of just-different-enough to keep things spicy. A few months ago Audi introduced an update to the R8 supercar’s bodywork and interior. This update to the TT RS brings the two wildest Audis into aesthetic parallel. The new front and rear bumper, Audi says, give the car a more masculine and “dynamic” look. Part of the reason for this update is the addition of extra radiators to keep everything cool. The front inlet ducts extend out into the fender now, melding with the front arch for an extremely wide look. It’s a bit like Audi has stuffed the TT RS’ cheeks with marshmallows and making it say ‘fluffy bunny’. Out back, the TT RS has a new fixed rear wing, a newly re-designed diffuser, and a new finisher for the dual exit exhaust. In all, not much else has changed. There is a new optional RS Design package, which adds accent color highlights to the air vents, seat belts, seats, center console, and floor mats. If you’ve got to have the new look bumpers and deviated stitching, you can place your order for a new TT RS starting on Thursday. Both Coupe and Roadster models will hit dealerships later this spring.